Today we went for a walk. It was a good walk – not a great one, because we still can’t seem to make it past about 3/4 of a mile before backs and feet start hurting. We’re consistent, anyway. We’ve walked every day for two weeks except last Saturday and Sunday, and Saturday we walked all over the Donald P. Stevens Convention Center in Rosemont, IL. So what if we were really just strolling as we looked at the quilts and booths – we were on our feet from about 10 am to 6 pm with just a couple of short breaks. And Sunday, well, that was recovery. I even made it to work at 8:50, 10 minutes early, which is a big challenge for me. And when I gloated a bit to my boss about being early, he asked if I could start coming in at 8:30. Next EQ… wait for it… 7!!! You never know when or where inspiration will arise! 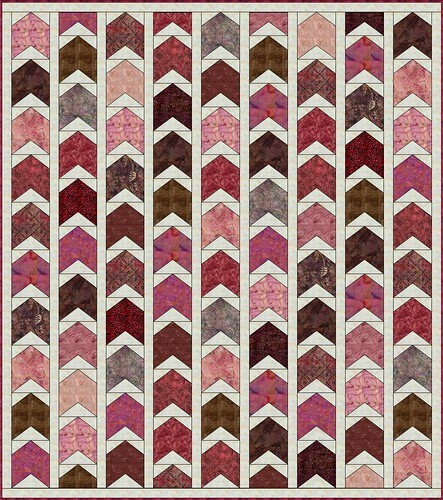 You were smart to act on it right away,I love the quilt design – it’s versatile and very effective, very pleasing! I like this quilt idea VERY much. This would be a beautiful quilt! I love the way this flying geese turned out! So simple but dynamtic. Good colors!